Solar power systems Canberra. Did you know you can use the energy of the sun to lower your electricity bill using Solar Power? Well you can! Solar Power is a renewable energy technology that harnesses the sun’s energy and coverts it into electricity. On this page you will learn more about PV (photovoltaic) Solar Power Systems and how ACT Smart Electrical & Solar can guide you in selecting the right type of solar power system for your home in Canberra. What is a PV (photovoltaic) solar power system? A PV (photovoltaic) solar power system generates electricity from the sun’s energy and feeds it back into the electricity grid. It’s a renewable and clean energy source of power available to almost every home. Utilising this clean energy source is a smart way to reduce (or eliminate) your electricity bill and contribute positively to reducing your carbon footprint. In short, solar power systems are good for you (e.g. empower you to pay less to your energy retailer) and the environment. Avoid being tossed around by electricity price rises. An appropriately designed and installed a solar power system will significantly reduce your power bill. Take a look at our solar power specials in Canberra to see what we are currently offering. 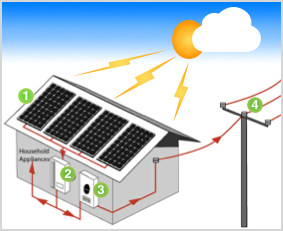 How does a PV solar power system work? In Canberra, ACT (Australian Capital Territory) and NSW, your home is connected to the electricity grid so the PV solar power system is referred to as a grid-connected PV solar power system. Solar Photovoltaic (PV) panels are generally fitted onto the roof of your home (ideally, facing North). The solar power panels harvest the power of the sun, generating clean renewal electricity. This conversion takes place within the solar panel. The solar power modules are connected to a device called an inverter. The inverter changes the DC voltage (power) generated by the solar panels to the AC grid voltage (i.e. 240 volts). The inverter is connected to a net-feed solar meter (located at your main switchboard). This meter records (instantaneously) how much power (i.e. kWh) your solar system is generating and how much power your house is using. If you are making more power than you are using the surplus electricity is exported back into the electricity grid (but your retailer will only pay you nominal amount for this surplus power). The net-feed solar meter is the interfacing device. It determines whether you are using power from your solar system or whether you are using power from your retailer. Depending on the size of your solar power system and how much power you are using, you can minimise or eliminate your daytime electricity bill. Now, that’s good news for you and the environment! Why you need a Solar Power System? Solar power systems can save you money! With electricity prices continuing to rise, you should seriously consider installing a PV solar system on your home. Now is an ideal time to install a solar power system. You may also qualify to receive some Federal Governement assistance (STCs) as a point of sale discount on your solar power system. Here in the ACT, net feed-in tariff is used, which means that you are only paid when the solar power system is generating more power than is being used by the house at that point in time. Any excess power is exported to the electricity grid* and you are paid for this amount at a nominal tariff rate set by your retailer. The best way to maximise your return, is to make some lifestyle adjustments and make best use of the power that your solar power system is generating e.g. as much as possible run your dishwasher, washing machine, air conditioner, etc during the day. In so doing, you are making the most of your solar power system. * Electricity Grid – An electrical grid is an interconnected network for delivering electricity from suppliers to consumers. Like the ACT, net feed-in tariff/metering is used in NSW. It is critical to design a system that meets you day time power consumption. As there are no state government subsidies for feed-in tariffs, it means you have negotiate directly with your electricity retailer as to what you’ll be paid for any surplus power you generate that gets fed back into the grid. What this means is the power your solar power system produces will be used in your home before it is exported to the electricity grid. ACT Smart Electrical & Solar size your solar power system with this in mind which means the system should pay for itself around five years. It is our objective to install your system and get you connected to the ACTEWAGL grid in the shortest possible time (typically, within 21 days). Here at ACT Smart Electrical & Solar we supply and install premium quality PV solar power products. The products we recommend last and perform better than entry level products typically used in the industry. We invest hours assisting clients to alter and repair cheap systems which have been purchased from companies based outside of the ACT/NSW regional area. ACT Electrical & Solar supply and recommend the following solar power products that have an industry proven track record in both quality and reliability. Inverters – SMA, Power One Aurora and Delta Solivia. Solar Panels – Trina, Q-Cells, Canadian Solar, Yingli Solar and Jinko Solar. Please see our “special deals” for current prices, here. Other system configuration and products are also available on request. We are able to supply and install other products depending on your specific needs and budget. To get your quotation for PV Solar Power System for your home, fill in the contact form here or call us today on [telnumlink]0401428522[/telnumlink]. Our home incurred some potentially dangerous electrical damage in a storm. The next day, I rang three electricians who advertised an after hours repair service. Two didn't answer, and one was so curt that I felt I couldn't engage his services. I then rang ACT Smart Electrical & Solar and caught Scott as he was leaving a job. He was very polite and friendly; he explained his cost structure and said he would be at my house in 20 minutes. Scott arrived on time, provided a professional service, fixed the problem, and explained what had caused it (and also pointed out that I had some cracked roof tiles). I'll highly recommend Scott to my friends.